Author’s note: This is the second of a two-part series outlining potential areas for improvement for Farming Simulator 19 (see Part I here). Farming Simulator is near and dear to my heart, and like a parent wishes for their child, I only want the best for the series. All of the suggestions in this feature are provided with the best intentions, and should be taken as a “wishlist” of sorts, and not as my realistic expectation of the improvements to be made (I recognize, for instance, that the development team is relatively small). I encourage those with alternative (or supporting) ideas to seek me out on Twitter to discuss. 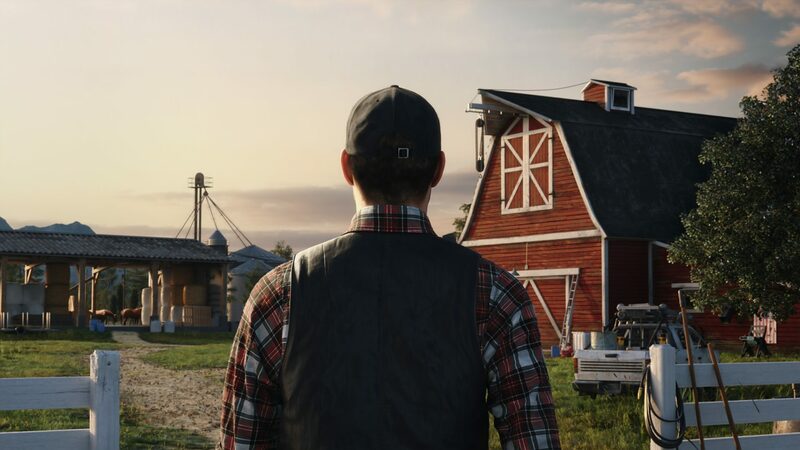 I’ve already outlined everything we know so far about Farming Simulator 19 in Part Iof this two-part series, so this second part will continue to focus on potential changes or upgrades that I feel GIANTS Software could make in order to maintain their position as the agricultural simulation genre’s perennial poster child. In particular, I’ll delve into broader possibilities such as additional game modes, equipment-based changes, and adjustments to the economy. While Real Farm was not without its issues, one thing that I think it got right was its introduction of a career mode to the agricultural simulator genre. Starting out as a new farmer, you had no equipment of your own and had to slowly build up your roster of vehicles and equipment, opening up the possibility of doing different types of jobs for other farmers, and finally purchasing your own farm. 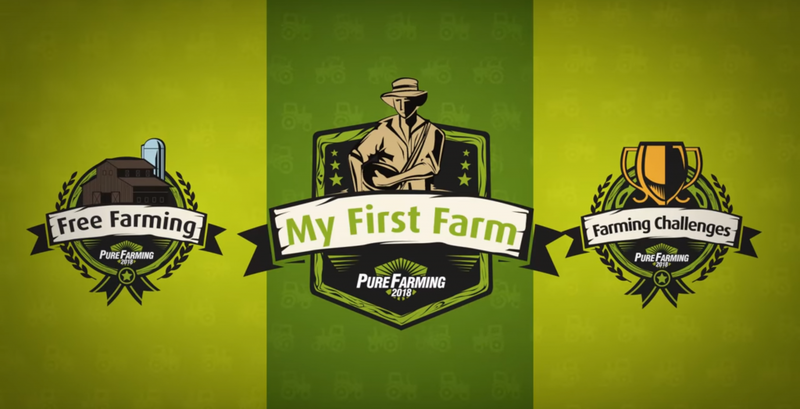 We’ve also seen something along these lines in Pure Farming 2018, which allows players to engage in three different modes: My First Farm, Farming Challenges, and Free Farming. In My First Farm, players start out with a small farm and minimal equipment, and are encouraged to improve the farm over time. Missions are a combination of work for other farmers, and work on the player’s own farm, allowing for some choice in how the player goes about developing their operation, but still providing some overarching direction to guide them in determining their activities. If Farming Simulator 19 could take this formula and expand on it, I think it could add some excellent depth to the game. I envision something like the aforementioned modes, where players could be provided with choice in who they work for, what types of jobs they take on, and what equipment they buy with the proceeds. Eventually they could work up to leasing or buying land from other farmers, and ultimately purchase a “starter farm” – ideally the player would be able to choose between several available locations, each with their own pros and cons. Giving the virtual farmers the ability to upgrade buildings would go even further in giving players reason to continue playing, and seeing physical change taking place on the farm could really aid in helping the player see the results from their hard work. This would also add yet another element of choice to the game, and allow players to feel as though they were really controlling their own destiny. Adding in some targets for the player to reach (e.g., accumulate a certain net worth, total owned acreage, number of animals, etc.) could provide an additional element of goal-oriented gameplay, providing a more guided experience for those players who might be overwhelmed by the typically extremely open-ended game. Pure Farming 2018 gives players three modes to choose from. 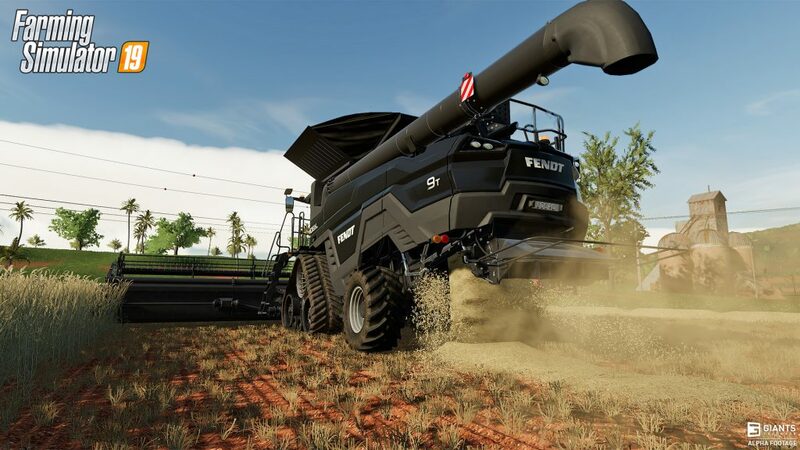 Will Farming Simulator 19 follow suit? Before I jump into this one, I should point out that I think that GIANTS does an incredible job with securing the rights to an absolutely massive number of major equipment brands, and creates beautiful, true-to-life in-game models of their real life counterparts. The quality and quantity of equipment in Farming Simulator 17 was staggering, and I have no doubts that the next version will somehow manage to improve over that. The above alpha screenshot is a perfect example of how the overhauled graphics engine opens up new possibilities in terms of the fidelity of in-game equipment models. However, I feel that GIANTS has the opportunity to improve the equipment in the game further than just in terms of how it looks. One relatively minor gripe I had with the equipment in Farming Simulator 17 was that at night time, the dashboard/panel wasn’t illuminated in the same way it would be in real life. Adding this would be just another small step towards greater realism without alienating any players (i.e., everyone would hopefully appreciate this change). Similarly, adding additional functionality to the in-cab consoles would go yet another step further in providing players with a true sense of what it’s like to operate these large pieces of machinery, and the advanced technology that’s utilized by modern farming operations. The graphics engine overhaul promises to make the game’s equipment even more gorgeous, but there are additional steps that could be taken to further enhance the level of realism, particularly inside the cab. There are also some more significant changes that could potentially elevate the series to new heights in terms of its attention to detail and vehicle-related realism. Many players have long complained about a lack of any consequences for smashing their vehicles into poles, fences, buildings, or other vehicles. As a result, some players drive with reckless abandon, knowing that any crashes can be rectified simply by (at best) carrying on their merry way, or (at worst) resetting the vehicle in question to the shop. With the introduction of the workshop in Farming Simulator 17, I think that GIANTS is working towards creating more options and features relating to vehicles, and I hope that one of them includes fixable damage. Further to this, a large part of any farming operation is the maintenance of its equipment. To date, we haven’t seen anything relating to this outside of a daily “maintenance fee” paid on each piece of equipment. There are no breakdowns, there is no down time for maintenance. In Farming Simulator 17, we saw the addition of “vehicle aging” – which took the form of an hour counter for each tractor and combine (which they have in the real world) – and the maintenance fee for each piece of equipment increased in accordance with the number of hours of work it. I hope that GIANTS will take this one step further and require players to conduct regular maintenance on their equipment, or else face consequences (e.g., being unable to use a particular piece of equipment for a day). Finally, I believe that players would benefit greatly from the ability to purchase used equipment for use on their farms. While we saw the introduction of the ability to lease vehicles in Farming Simulator 17, this can still be very costly over time and does not accurately represent the way in which many farmers obtain equipment. If players were able to purchase used equipment from a dynamic catalogue (ranging from “like-new” to “heavily used”), they could weigh their needs against the possibilities of buying new, leasing new, or buying used – the latter of which would likely be accompanied by higher maintenance costs. While the economy in Farming Simulator 17 was a vast improvement over that seen in Farming Simulator 15 (namely in the number of selling points available and how prices changed) I felt that it still remained relatively predictable. After playing for a while, I knew the highest point that each commodity would reach (and which selling point was best for each crop) and simply waited until that price returned. I feel that while the economy doesn’t need any drastic changes, it would benefit from one specific adjustment. 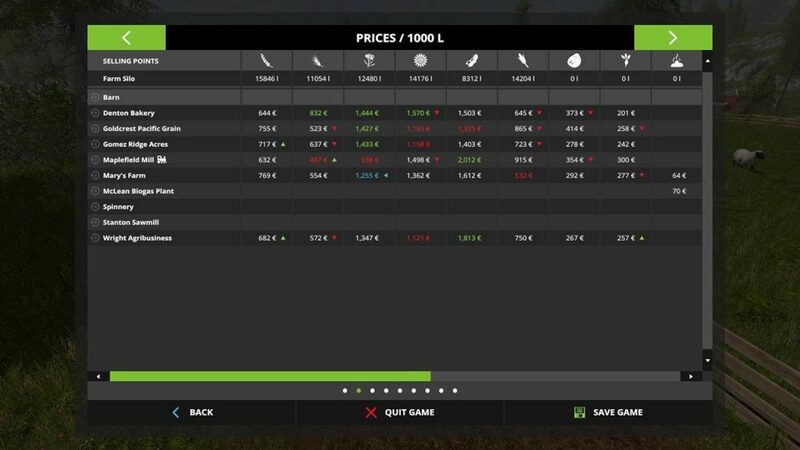 In my opinion, Farming Simulator 19’s economy could be greatly improved by adding the ability for players to enter into simple futures contracts with the game’s selling points. Futures contracts are becoming increasingly common in modern agriculture, and provide farmers with the ability to manage risk by entering into a contract to deliver a certain amount of a commodity for a specified price. With the ability to “lock in” a price for their products, farmers have increased certainty about their income and are less subject to market volatility. If GIANTS were to add a mechanic like this to the game, they could even implement it in such a way that the “buyer” (the in-game selling point) could provide the player with some cash up front, which might enable faster growth and provide some incentive to enter the contract (e.g., the player could use the money to buy or lease a new combine to harvest the crop). It would also provide certainty that they’ll receive a guaranteed price for the product when they deliver it, allowing them to plan around having a predictable income source at a given time, rather than potentially being forced to wait until the prices for that commodity happen to rise to an acceptable level. While it seems contrary to the point of futures contracts, adding this element could in turn add an element of risk to the game (and to me, risk = excitement!). If implemented in conjunction with weather and seasons as well as the additional yield factors, if a player signs a contract for a certain amount of a crop but then is unable to deliver it in time (say, if it rains and they can’t harvest) or their yield isn’t high enough to deliver the full quantity (if they didn’t properly manage the yield variables), they could be penalized a certain percentage of the total value of the contract. On another note, I feel that GIANTS would be remiss not to include the ability to lease land in Farming Simulator 19. With the addition of the option to lease vehicles in Farming Simulator 17, it seems a natural step to extend that mechanic to land. Players could lease land for one crop cycle, paying a much lower price than they would to buy it, which would allow them to farm a larger area without needing the significant capital required to outright purchase additional acreage. GIANTS increased the complexity of the in-game economy for Farming Simulator 17. Will they enhance it even further in the next iteration? There are many other changes that could be made to Farming Simulator that don’t fit into the above categories – things like manual hitching of equipment to tractors; the ability to move animals from place to place (as well as increased detail in caring for them, and additional complexity to the selling economy); and the potential for adapting mods such as Courseplay (effectively setting routes for hired workers), Follow Me (having workers with various equipment follow the player to a field to reduce the need to make multiple trips), and GPS (just like in real-life farming, letting a computer system keep the equipment driving in a straight line) into the base game. I suppose, at the end of the day, that it likely isn’t a question of if GIANTS will make some major improvements to the game, but rather, which ones they will choose to focus their efforts on. I know that regardless of any changes made, the core gameplay that’s brought the series its success will remain – and that excites me. GIANTS has shown that changes to the game aren’t taken lightly or done on a whim, and I’m sure that attitude will be apparent in the differences we see between Farming Simulator 17 and 19. If the months leading up to the release of Farming Simulator 17 were any indication, GIANTS is excellent at sharing information on the modifications that they’ve made, and I anticipate their approach to Farming Simulator 19 to be no different (you can read my analysis of GIANTS’ transparency in development here). I look forward to sharing my thoughts on any details released in the coming months as we inch ever closer to the “late 2018” release window.